What does it mean to build a season? How can you put in motion the micro and macro steps that will take you to peak fitness? 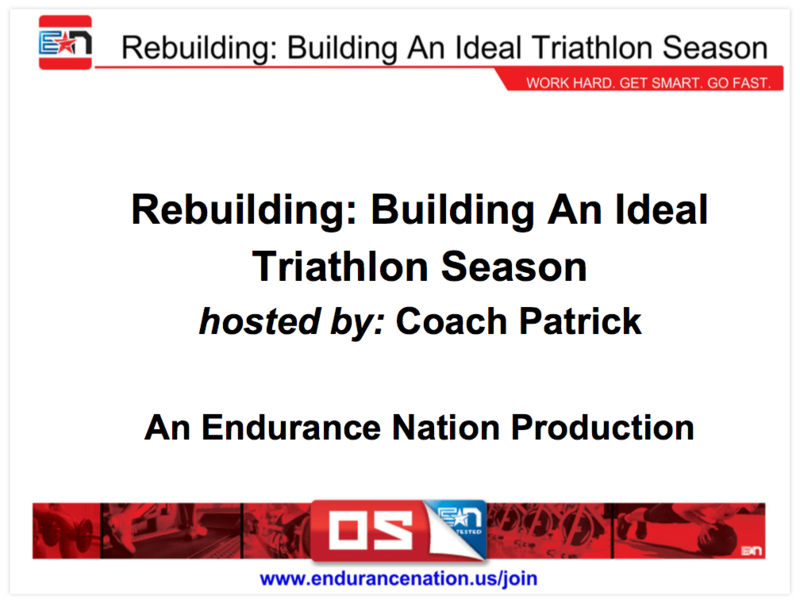 Join Coach Patrick from Endurance Nation (www.endurancenation.us) as he breaks down your triathlon season into four phases, each with distinct goals. Then dive into our focused OutSeason® program for more specifics around creating the best possible training week. Bonus includes how to choose the next sport to focus on based on your fitness and experience. The Endurance Nation OutSeason® Training Plans are the cornerstone of our members’ success. In just 14 weeks, doing only six to eight hours of focused training, they set the tone for their entire upcoming season. Watch this webinar to learn more about the OutSeason® and how it works in your year! Endurance Nation is the world’s largest and fastest online triathlon team. Three-time Ironman® TriClub Division 1 World Champions, creators of the Four Keys of Race Execution and home of the FirstTimeFinish™ Guarantee. Official coaching partners of Rev3 Triathlon and TriSports.com. Create your free 30-day trial here.